 American Beech (Fagus grandifolia) - larger, very smooth bark. Edible: The nuts are edible and delicious. Notes: This tree was once quite common until a blight from overseas decimated the population. Trees used to grow very large, over 100 feet tall. However, nowadays they seldom reach a height of 30 feet before succumbing to the disease. Photographs: 74 photographs available, of which 7 are featured on this page. SCROLL DOWN FOR PHOTOGRAPHS. 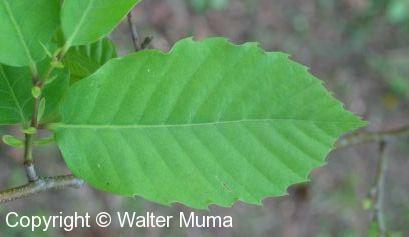 Note the similarity of the leaves to American Beech (Fagus grandifolia). Twig with expanding buds, in May. Empty nut shell. The nuts are edible, and quite delicious. However, if you find any, please do not collect them in any quantity, perhaps only a couple to taste. The nuts are valuable food for wildlife, and also to help propagate the tree. Bark of a mature tree (or, rather, as mature as they get these days). Bark of a young tree. 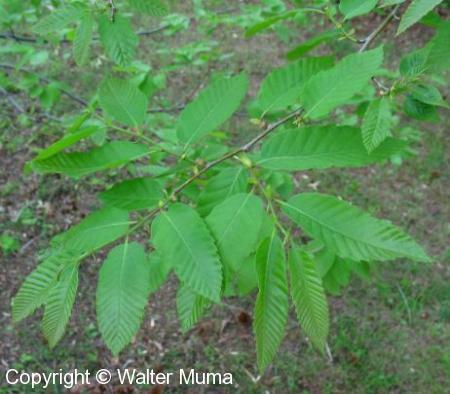 Here's a view of the clump of American Chestnut that the above two photos are enlarged from.